Astrology is a symbolic science. Such a statement might seem to be an oxymoron or at least a contradiction in terms. In fact the word symbol has two distinctly different meanings. One is where a character is used as a conventional representation of an object, function, or process. An example is the letters standing for a chemical element, i.e. Fe stands for Iron. Within the field of chemistry, it will always stand for Iron and nothing else, so when a chemist uses the term, everyone knows exactly what they are talking about. The second definition of a symbol is a thing that represents or stands for something else, especially when representing something abstract. The words Fe have been used to represent lots of different things : a shorthand for extraverted feeling in the Myers-Briggs character analysis, a symbol for the f-rune, the name of a Cuban League baseball team, a leap year that starts on a Tuesday, and an abbreviation for lots of unconnected ideas like further education, focus economics, flight engineers, field emissions etc. Whereas conventional science would accept the first definition and reject the second as having no real value, astrology’s use of symbols combines something of both definitions. When we say the Sun is in Aries, we are with the first definition of the symbol, because we know that this refers to the period of 30 odd days after the Spring Equinox and anyone born during this period will be called an Arien. Most of us have a reasonable understanding of what this means due to the character of what is happening in nature at this time of year. The Sun is in the sign at a time of very speedy growth in the early Spring, so Ariens will be understood to have a tremendous desire to assert themselves and to get things started, even if they have to fight to do so. They are known for being quite combative and inspiring pioneers who can easily get bored and move onto something else. This energy can actually manifest in a person’s life in many different ways but the scientific idea of a symbol always representing the same thing would insist on the same results each time the symbol is used. So therefore every Arien would be a soldier or at least a competitive sportsman. If this is not verifiably the case in a statistically significant number of situations the symbol and the science of astrology is rendered invalid. But in fact there is nothing in the Universe that corresponds strictly to this definition. Even something as fundamental as Iron has many qualities and can manifest in different states. Iron is by mass the most common element on Earth, forming much of Earth’s outer and inner core. We think we understand it and we say something is as hard as iron, but pure iron is soft, it is only significantly hardened and strengthened by impurities, such as carbon, from the smelting process. A certain proportion of carbon (between 0.002% and 2.1%) produces steel, which may be up to 1000 times harder than pure iron. Elemental iron occurs in meteoroids and other low oxygen environments, but is reactive to oxygen and water. Fresh iron surfaces appear lustrous silvery-gray, but oxidize in normal air to give hydrated iron oxides, commonly known as rust. Unlike many other metals which form passivating oxide layers, iron oxides occupy more volume than iron metal, and thus iron oxides flake off and expose fresh surfaces for corrosion. So it can change in colour and volume. Iron also plays an important role in biology, forming complexes with molecular oxygen in hemoglobin and myoglobin; these two compounds are common oxygen transport proteins in vertebrates. Iron is also the metal used at the active site of many important redox enzymes dealing with cellular respiration and oxidation and reduction in plants and animals. So if we take such a simple definite symbol as Iron, we see that it is not one single thing but has a range of properties that will alter depending on the environment that it finds itself in. Exactly the same thing applies to an astrological symbol. An Aries in the military might be expected to act in a certain way, whilst the same character in a sedentary office job would behave quite differently. So astrology requires scientists to apply the same leeway to our subject that they give to their own without even realising it. What is needed is a broad understanding of the capacity of a symbol and the intelligence to understand its adaptability to different situations whether this symbol is Fe or SO / AR. So if we take the symbolism of a stellium in Leo including the Ascendant and a exact conjunction of the Sun and Jupiter, this does not mean that everyone who has it must be a king. For one thing there would not be enough countries for them all to rule over. Such a person could easily be an actor or a performer as they would have a natural confidence combined with the desire to live life as the centre of other people’s attention. They could be a philanthropist as they have a naturally generous nature. Its certainly likely that they would naturally gravitate to being a leader in their field but the actual result of this would be dependent on all kinds of things, like socioeconomic background. They could be a leading world statesman or the gaffer of a small team of people running a local dustcart. An astrological symbol has many different applications. One very strong connection with Leo is that of the heart, so perhaps we should expect everyone with such a stellium to be a successful heart surgeon ? Well it certainly worked for Denton Cooley. Denton Cooley was an American heart surgeon famous for performing the first implantation of a total artificial heart. He also has a stellium in Leo of 4 planets and the Ascendant, including the closest Sun / Jupiter conjunction that Capricorn Research has ever seen. Cooley’s Pluto moment was when it was conjunct his Sun in 1956 / 7 when he had joined forces with the other greatest heart surgeon in America, Michael DeBakey where he worked on developing a new method of removing aortic aneurysms, the bulging weak spots that may develop in the wall of the artery. As partners Cooley and Debakey pioneered operations at Baylor College of Medicine. Cooley’s skill as a surgeon was demonstrated as he successfully performed a number of bloodless open-heart surgeries on Jehovah’s Witness patients beginning in the early 1960s after he had left DeBakey’s practice. The moment that immortalised him however, was in 1969 when he became the first heart surgeon to implant an artificial heart in a man, Haskell Karp, who lived for 65 hours. In 1970, “he performed the first implantation of an artificial heart in a human when no heart replacement was immediately available”. Neptune was square to Cooley’s Sun / Jupiter throughout 1969 – 70. Why was the most important breakthrough of Cooley’s life the result of a Neptune transit rather than a Pluto one ? Because there was a degree of deception, and trickery involved which began one of the greatest and longest running feuds in medical history. Cooley, without approval from DeBakey or Baylor, commandeered an artificial heart from his former partner’s lab and implanted it in Haskell Karp. Over the years, DeBakey has called that first-ever use of a total artificial heart a theft, a betrayal, unethical and “a childish act” to claim a medical first. Cooley defended the implant as a desperate, if ultimately unsuccessful, act to save a life. The American College of Surgeons censured Cooley, Baylor and the National Insititues of Health, which paid for the research to develop the artificial heart, ordered investigations. Baylor’s report was not made public, and the government’s findings cannot be found, spokeswomen for both institutions said. The furor led Cooley to resign from Baylor. Denton Cooley has an exact Sun / Jupiter conjunction in Leo so he would receive all the acclaim for performing the world’s first artificial heart operation. He also has Neptune exactly conjunct the Ascendant which points to a piece of deception and betrayal. However the thing that really shows up his doing over his former partner is the opposition from his Sun / Jupiter to a tricky Uranus in the 7th house of partnerships. Leos are always ready to receive plaudits and acknowledgments from their audience. And which sign is likely to be the one staying in the background, doing all the work while someone else takes the credit ? Of course its Virgo. We do not have a birth time for Debakey but a noon chart provides enough data. He has the Sun conjunct Mars in Virgo. Mars is the ruler of surgery and is often prominent in charts of surgeons. 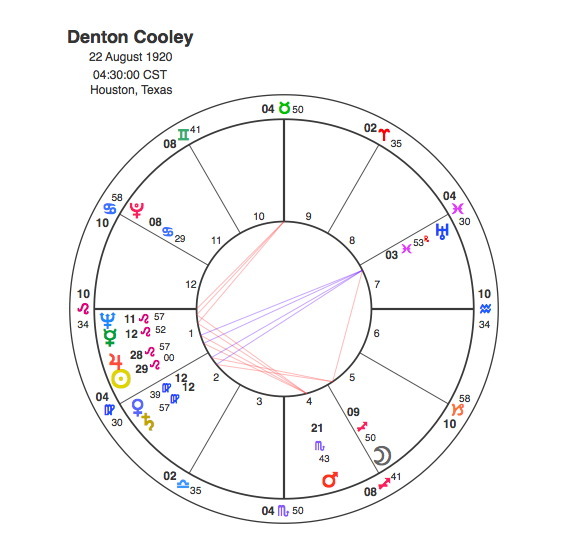 Denton Cooley also has a Sun / Mars aspect, the square. The synastry between the two charts is fascinating. They were born 12 years apart and both men have Jupiter in exactly the same place at 29 degrees Leo. Why at the end of Leo ? It is because as surgeons involved with the beginning of the artificial heart, they represent the end of the period of the hearts natural dominance. Humans have finally overcome nature in this area. So Jupiter at 29 degrees Leo represents their contribution to mankind. The thing is, one of these men, Denton Cooley had the Sun in exact conjunction with Jupiter so he gets all the plaudits for this work. Michael Debakey had done most of the preparatory work behind the scenes but did not get the credit for it ( Sun in Virgo ) and was left to nurture a life long feud ( Sun conjunct Mars ). Debakey’s Sun is closely conjunct Cooley’s Venus / Saturn conjunction showing us that a connection with Cooley would bring him both a rewarding partnership ( Venus ) and a great loss and suffering ( Saturn ). Both men had birthdays within a couple of weeks of each other. This means that Pluto would make its conjunction to both their Suns during the period of time that we are considering. As has been noted Cooley’s Pluto / Sun transit occurred in 1956 – 7 as he began working with Debakey. Debakey’s Pluto / Sun transit was between 1964 and 66 and was enhanced by Uranus being in the same position from 65 to 66. It was in 1966 that DeBakey had been the first to successfully implant a partial artificial heart, a left ventricular assist device, in a patient. As DeBakey, Cooley and others succeeded in operations the need for a device that could pump for both ventricles, a total artificial heart, became more apparent. The urgency became even greater in 1967, with the first human-to-human heart transplant in South Africa. That created the need for mechanical devices as a bridge to transplant, if not for permanent use. The artificial heart was developed in DeBakey’s lab at Baylor, with funds from the National Heart Institute. It was a half-pound device of plastic and Dacron, linked by plastic tubes to a bedside control console. In true Virgo fashion, Michael DeBakey had never sought approval to use the device in a patient, for lack of good experimental evidence that it worked even in calves. Such a reserved fussiness with details would be lost on a Leo however. Leos are far more likely to act out of a sense of drama and Denton Cooley’s defence for taking and using the heart without permission was that it was required in an emergency to save Haskell Karp’s life, even if only worked for two or three days. The feud between the two surgeons continued for the best part of 40 years and they only achieved a reconciliation when Debakey was 99 years old, shortly before his death. If everyone was asked the question ” Which star sign do you dislike the most “, Capricorn Research would be prepared to bet that the most common response would be the sign adjacent to theirs. Whilst it may be tempting to plump for the opposite sign as the perceived enemy, the Zodiac has a way of producing consecutive signs with a real antipathy for each other. As we go through the yearly cycle, each sign is a reaction to the one before it. Its as if, by the time we have endured 30 days of a sign, the Universe is heartily fed up with that particular energy and wants to immediately replace it with something very different indeed. And nowhere else in the years cycle is the difference more apparent than in the change from Leo to Virgo. Cooley and Debakey’s roles in this saga and the 40 year feud that resulted from it is clear evidence of this consecutive sign antagonism. Its an odd thing really because both signs also need each other in order to perform their own natural functions. After all where would the regal Leo be without a coterie of Virgoan servants, happily doing all the work behind the scenes to maintain the power of the throne ? Virgo needs someone to serve, and Leo is happy to receive their service. But if there are any Virgoans wanting to get the credit for their efforts at work, here’s some simple astrological advice – don’t form a partnership with someone whose birthday is a few weeks before yours ! Ehhh…remember that Leo is the mighty LION of the Zodiac, the warrior-king, gladiator, conqueror, hero, and apex oredator. He too is an athletic fire sign so it’s annoying when modern astrologers try to tame into this exaggerated show kitty. He is a warrior-king and predator and should be portrayed as such.